The Phillips 66 Refinery located in Ponca City, Oklahoma, has a crude oil processing capacity of 198,000 barrels per day (bpd) making it by far the largest refinery in Oklahoma. The refinery processes a mixture of light, medium and heavy crude oil. Most of the crude oil processed is received by pipeline from the Gulf of Mexico, Oklahoma, Texas and Canada. Additional foreign crude is purchased into the Gulf Coast and delivered by pipeline. The Ponca City Refinery is a high-conversion facility that produces a full range of products, including gasoline, diesel fuel, jet fuel, LPG and anode-grade petroleum coke. Its facilities include fluid catalytic cracking, delayed coking and hydrodesulfurization units. Finished petroleum products are shipped by truck, railcar, and company-owned and common-carrier pipelines to markets throughout the Mid-Continent Region. The Phillips 66 Refinery in Ponca City is the most profitable refinery of Phillips 66's fourteen worldwide refineries, contributing a net profit of over $500 million in 2011 to Phillips bottom line, over one-quarter of the net profits for the entire Refining Business Segment. For 2012, profits are on target for the Ponca City Refinery to contribute of over $600 million of net profit to Phillips bottom line, one-third of the net profits for the entire Refining Business Segment. When an oil producer sells to a refiner, they generally agree to a price set on an exchange such as the New York Mercantile Exchange. After the oil is refined into gasoline, it is sold by the refiner to a distributor, again pegged to the price of wholesale gasoline on an exchange. Finally, gas station owners set their own prices based on how much they paid for their last shipment, how much they will have to pay for their next shipment, and, perhaps most importantly, how much their competitor is charging. Oil companies and refiners have to accept whatever price the market settles on -- it has no relation to their cost of doing business. When oil prices are high, oil companies make a lot of money, but they can't force the price of oil up. There are two benchmarks for oil prices that are very important to determining the profitability of the refinery at Ponca City: Brent and West Texas Intermediate (WTI). Brent Crude is a major trading classification of sweet light crude oil comprising Brent Blend, Forties Blend, Oseberg and Ekofisk crudes (also known as the BFOE Quotation). Brent Crude is sourced from the North Sea. The Brent Crude oil marker is also known as Brent Blend, London Brent and Brent petroleum. West Texas Intermediate (WTI), also known as Texas light sweet, is a grade of crude oil used as a benchmark in oil pricing. This grade is described as light because of its relatively low density, and sweet because of its low sulfur content. It is the underlying commodity of Chicago Mercantile Exchange's oil futures contracts. The price of WTI is often referenced in news reports on oil prices, alongside the price of Brent crude from the North Sea. Prior to September 2010, there existed a typical price difference per barrel of between +/-3 USD/bbl compared to WTI and OPEC Basket. Since the autumn of 2010 there has been a significant divergence in price compared to WT with a $10-$15 spread between the two developing that has remained ever since.. Many reasons have been given for this widening divergence ranging from a speculative change away from WTI trading (although not supported by trading volumes), Dollar currency movements, regional demand variations, and even politics. The depletion of the North Sea oil fields is one explanation for the divergence in forward prices. According to James Hamilton writing at Econbrowser, the gap is essentially a geographic difference between the price paid for oil in the central United States and that paid on the U.S. coasts and anywhere else in the world. In February 2011 the divergence reached $16 during a supply glut, record stockpiles, at Cushing, Oklahoma and is currently (August 2011) above $23. Historically the different price spreads are based on physical variations in supply and demand (short term). Barclays Plc (BARC) cut its 2012 forecast for West Texas Intermediate oil on July 5. WTI will average $96 a barrel this year and Brent will average $113, according to a report published today by analysts Paul Horsnell and Amrita Sen in London. That’s down from $105 for WTI and $120 for Brent that the bank had projected in a report on June 25. So right now the differential is $17 per barrel. Companies that have pipelines in the Mid-Continent region - which is to say, the Texas Panhandle, Oklahoma, Kansas - are inherently in a position to source cheap crude. And companies that have refining assets on the coasts - the West Coast, the East Coast and the Gulf Coast - are in a much tougher position when it comes to sourcing cheap crude because, generally speaking, they have to buy crude that's imported. And import crudes are at a premium to WTI. The CEO of Phillips 66 says to process more shale oil "everywhere we can get it." "We want to increase our exposure in both the West Coast and East Coast for some of those advantaged barrels." That includes more rail unloading, rail cars and storage to facilitate, in the medium term, movement of cheaper inland crude to coastal markets until more pipelines are built to alleviate bottlenecks, he said. Phillips 66 is the only refiner that has plants in all U.S.markets. Garland noted several refineries are already well positioned to receive shale oil, such as its 247,000 barrels-per-day (bpd)refinery in Sweeny, Texas, in proximity to the state's prolific Eagle Ford shale play, or Midwest plants. 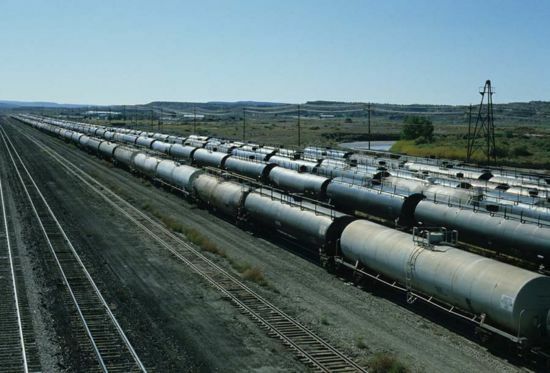 Last fall Phillips 66 also ran unit trains from the Bakken shale oil play in North Dakota to its 238,000 bpd Bayway refinery in Linden, New Jersey, and has taken trains to West Coast refineries. "You'll see us stepping out and doing some more things around infrastructure," he said. "Like everyone else, we're doing everything we can to get more barrels in front of those facilities." Today we can process about 500,000 barrels a day of TI-related and about 100,000 barrels a day of shale related crudes. The reason for their high profitability has been the glut of crude oil pouring into the region from newly tapped shale oil plays like North Dakota’s Bakken. "Because there was a lot of new oil and not enough pipeline capacity to get it down to the Gulf Coast mega-refineries, the crude got bottled up in the storage tanks at Cushing," writes Helman. "The bottleneck that kept oil from getting out of Cushing also kept its price at a record-wide discount relative to its rival European benchmark Brent crude. At one point last year you could buy a barrel of WTI for $27 less than a barrel of Brent. In an April conference call with analysts, Garland said the company had been generating $90 million in annual net income for every dollar of WTI-Brent price differential that it could capture for its refineries. The adjusted earnings (profit) from the Refining and MarketingBusiness Segment of Phillips 66 for the years 2009, 2010, and 2011. From a presentation by Clayton Reasor, Senior Vice President for Strategy and Corporate Affairs to industry analysts on May 24, 2012. Click on the figure to enlarge. Phillips 66 has 15 refineries globally and 2.2 million barrels a day of capacity. "When we think about our refining business we like to think about it in four segments. One is the Mid-Continent, about 21% of our capacity is there. Margins have been very strong in this area, as you know," says Phillips 66 CEO Greg Garland. "Our largest region is the Gulf Coast, about 33% of our capacity is there.We have large economy of scale here. We have very complex refineries on the Gulf Coast. 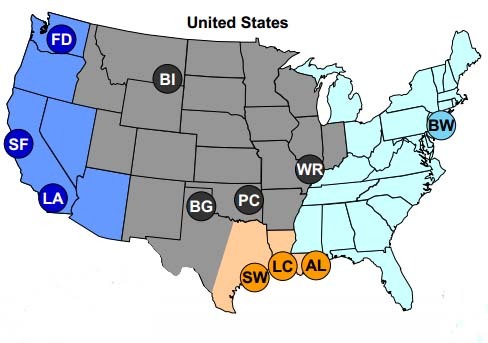 The Western US and Pacific region is about 20%, includes our interests in the Melaka refinery.The West Coast has typically had high margins historically, but the last couple years has been challenged in part due to the economic slowdown in California." The methodology for determining the profitability of the refinery at Ponca City is to begin with a very crude estimate of profitability using figures from Phillips 66 presentations to financial analysts, and then to drill down into these figures and add in additional factors, refining the figures through more detailed scenarios to come up with a better estimate. Phillips 66 does not break out their profitability by refinery. However they do provide the profitability of theRefining and Marketing Business Segment and they further provide the profitability of their domestic refineries and their international refineries. Further Phillips 66 CEO Greg Garalnd has provided guidance as to the what protion of the R&M Business Segment is due to advantaged oil that is TI related and refined in the Mid-Continent refineries that includes the Borger Refiner, Ponca City Refinery, Wood River Refinery, and Billings Refinery. Scenario 4: Determine the portion of the R&M Profitability which is not attributable to advantaged TI-related oil and allocate it to each refinery based on throughput capacity. Include a correction factor for the portion of the R&M profitability that is attributable to Marketing. Scenario 5: Determine the sum of TI-related net income (Scenario 3) and non-TI-related net income (Scenario 4) for each refinery. Scenario 6: Determine the projected profitability of each refinery for 2012 using the latest information available on the WTI-Brent Differential from independent petroleum industry analysts. The very simplest formulation for determining the profitability of of the Ponca City Refinery is to simply look at the overall R&M profits for 2011 ($2,664 Million) and divide it by the fourteen Phillips 66 worldwide refineries giving a profit contribution of $178 million for each refinery. Phillips 66 breaks out the profitability of the Refining and Marketing Business Segment by international refineries and by domestic refineries, so we will look at only the domestic refineries in the second scenario. Dividing the R&M profits for domestic refineries for 2011 ($2,365 Million) by the eleven Phillips 66 domestic refineries gives a profit contribution of $215 million for each domestic refinery. According to Phillips 66 CEO Greg Garland, each dollar of WTI-Brent differential translates to $90 million in additional net income to Phillips 66. West Texas Intermediate is used in Phillips' mid-Continent refineries. In 2011 the average differential for WTI crude was $15 which equals $1,250 million in net income to Phillips. Breaking out the TI-related advantaged oil that is refined in Phillips 66 mid-continent refineries. Note that the Wood River refinery is owned by WRB Refining, Phillips 50-50 joint venture with Cenovus Energy Inc. The Borger refinery is operated by Phillips in a 50-50 joint venture with Cenovus Energy Inc. Therefor only half of the throughput of each of these two refineries is will be attributed to Phillips 66 for purposes of calculating the use of TI-related advantaged crude. The total throughput of the four mid-continent refineries is 531,000 barrels per day. The Ponca City Refinery, with a throughput of 187,000 bpd, accounts for 35.2% of the TI-related advantaged crude. 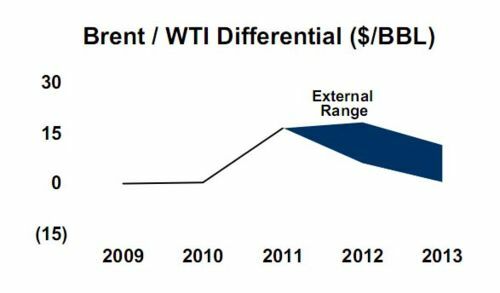 Slide 9 from Phillips' April 9, 2012 presentation to investors shows that Phillips 66 expects to Brent-WTI differential to be a significant factor in their profitability for years to come. According to Phillips 66 CEO Greg Garland, each dollar of WTI-Brent differential translates to $90 million in additional net income to Phillips 66. West Texas Intermediate is used in Phillips' mid-Continent refineries. In 2011 the average differential for WTI crude was $15 which equals $1,250 million in net income to Phillips. The Ponca City Refinery, with a throughput of 187,000 bpd, accounts for 35.2% of the TI-related advantaged crude producing $475 million in net profit for Phillips 66 in 2011. Businessweek reports that according to the Barclay's crude price forecasts for 2012, WTI will average $96 a barrel in 2012 and Brent will average $113, according to a report published by analysts Paul Horsnell and Amrita Sen in London - a differential of $17. Under Scenario 6 for 2012, with a contribution to Phillips 66's net profit of over $600 million the Ponca City refinery will contribute one-third off all the net income for Phillips 66's net profits for all refineries and more than the seven least profitable refineries combined. 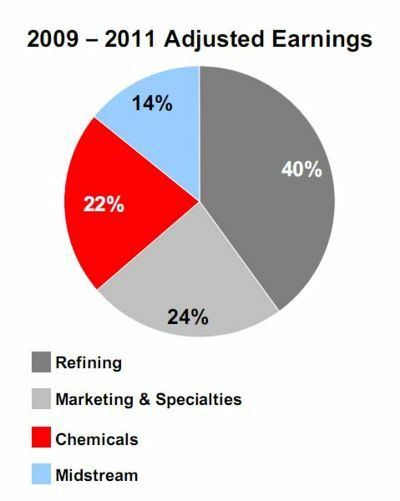 Phillips 66 does not break out the marketing earnings separately for the Refining and Marketing Business Segment in their reports. However slide 16 from the April 9, 2012 presentation to investors shows that for the years 2009 to 2011 marketing contributed 24% to Phillips 66 total earnings while Refining contributed 40% to Phillips 66 total cumulative earnings earnings for those years. The total adjusted earnings for the Refining and Marketing Business Segment for 2009, 2010, and 2011 was $ 4,057 million. Marketings contribution to the R&M bottom line would be 37.5% which translates to $1,521 million and on the assumption the marketing profitability was relatively stable across the three year period would be $507 million for each of the three years.. Subtracting out for earnings attributable to TI-related advantaged crude gives $1,015 million in net income attributable to normal earnings for refining during this part of the business cycle and attributed to each domestic refinery on the basis of throughput capacity. Phillips 66 does not break out the marketing earnings separately for the Refining and Marketing Business Segment in their reports. However slide 16 from the April 9, 2012 presentation to investors shows that for the years 2009 to 2011 marketing contributed 24% to Phillips 66 total earnings while Refining contributed 40% to Phillips 66 total cumulative earnings earnings for those years. The total adjusted earnings for the Refining and Marketing Business Segment for 2009, 2010, and 2011 was $ 4,057 million. Marketings contribution to the R&M bottom line would be 37.5% which translates to $1,521 million and on the assumption the marketing profitability was relatively stable across the three year period would be $507 million for each of the three years. This leaves $543 million in normal non TI-related profitability for 2011 to be divided among the 15 domestic and international refineries, so based on throughput the net income for normal refinery operations attributable to the Ponca City Refinery is 10% of Phillips 1,866,000 bpd in domestic production which translates to an additional $ 54 million in net income attributable to the Ponca City Refinery after the adjustment for marketing has been made. 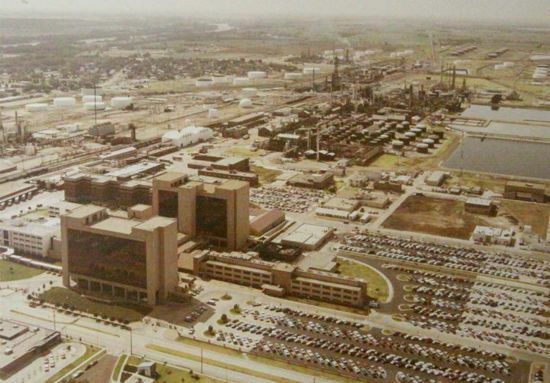 With a a contribution to Phillips 66's net profit of over $500 million, the Phillips 66 Refinery in Ponca City contributes more than one-quarter of the net income to Phillips Refining bottom line and contributes more than the the total of the seven least profitable Phillips refineries combined. In 2012 the throughput of the refinery increased from 187,000 bpd to 198,400 bpd by the installation of new equipment at the refinery in Fall, 2011. Businessweek reports that according to the Barclay's crude price forecasts for 2012, WTI will average $96 a barrel in 2012 and Brent will average $113, according to a report published by analysts Paul Horsnell and Amrita Sen in London - a differential of $17. For 2012, with a a contribution to Phillips 66's net profit of over $600 million the Ponca City refinery will contribute one-third off all the net income for Phillips 66's net profits for all refineries and more than the seven least profitable refineries combined. If you have additional information, insights, or corrections for this report please contact the author at hughpickens AT gmail DOT com. ConocoPhillips Analyst Meeting - Color Slides "ConocoPhillips Conference Call to Discuss its Pursuing Plan to Separate Into Two Stand-Alone, Publicly Traded Companies" July 14, 2011. ↑ Bartlesvile Examiner-Enterprise. "ConocoPhillips, Phillips 66 have deep roots in Bartlesville" by Ryan Lance and Greg Garland. May 1,2012. ↑ USA Today. "What — and who — makes gasoline prices rise" by Jonathon Fahey. March 23, 2012. ↑ Econbrowser. "Brent-WTI spread" by James Hamilton. April 17, 2011. ↑ Wall Street Journal. "WTI And Import Crude Price Differentials Create Profit Margin Advantages For Mid Continent Refiners Over Coastal Peers; Imports Currently Trade At $10 Premium Over West Texas Intermediate" an interview with Pavel Molchanov. January 9, 2012. ↑ Reuters. 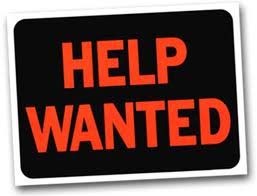 "Phillips 66 aims to run more shale oil" May 1, 2012. ↑ Seeking Alpha. "ConocoPhillips' CEO Hosts Phillips 66 Analyst Update Conference Call (Transcript)" April 9, 2012. ↑ Reuters. "Oklahoma refineries, pipelines unaffected by quakes" November 6, 2011. Hugh Pickens (Po-Hi '67) is a physicist who has explored for oil in the Amazon jungle, crossed the empty quarter of Saudi Arabia, and built satellite control stations for NASA all over the world. Retired in 1999, Pickens and his wife moved back to his hometown of Ponca City, Oklahoma in 2005 where he cultivates his square foot garden, mows nine acres of lawn, and photographs local events at the Poncan Theatre and Ponca Playhouse. 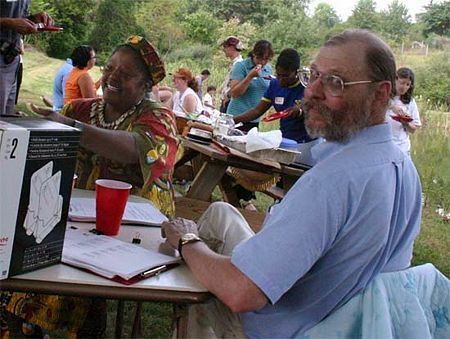 Since 2001 Pickens has edited and published “Peace Corps Online,” serving over one million pageviews monthly. His other writing includes contributing over 1,200 stories to “Slashdot: News for Nerds,” and articles for Wikipedia, “Ponca City, We Love You”, and Peace Corps Worldwide. I am an independent investor who is a stockholder in Phillips 66 and the purpose of this web site is to follow Phillips 66 to document and understand the company's plans and policies particularly with respect to its Refinery and Marketing Business Segment with a special emphasis on evaluating the impact of Phillips 66 business decisions on the Marland Refinery in Ponca City, Oklahoma. I began building my position in PSX when Phillips 66 went public on May 1, 2012 and am long PSX. I will disclose publicly if I close my position on PSX or go short. Unless stated otherwise, there is a citation for every statement in this article. The only exception is the "Conclusions Section" in this report which includes my own judgments and findings. Nothing in this report is to be taken as a recommendation to buy or to sell stock in Phillips 66 (PSX). I am an advocate that that it would be beneficial for both Phillips 66 and the community of Ponca City for Phillips 66 rename its Ponca City refinery the "Marland Refinery in Ponca City" to honor an oil pioneer who together with Frank Phillips brought prosperity and advancement to Northern Oklahoma. This web page is frequently updated so check back periodically to see the latest information on "Phillips 66 and Ponca City." If you have any additional information or insights that you would like to see added to this report on Phillips 66 and Ponca City please contact Hugh Pickens by email at hughpickens AT gmail DOT com.